North American restaurants typically offer two kinds of salad: Green Salad, typically consisting of a few greens, some lettuce and tomato, and a low fat dressing - everything new dieters loathe about salads - and Caesar salad. 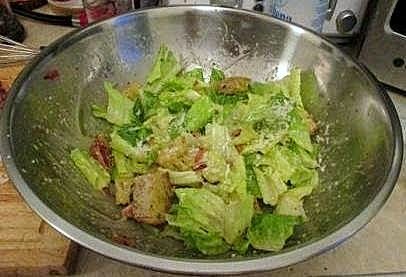 Everyone loves a good Caesar Salad. It's creamy, crunchy, salty, smoky, and though it gives the illusion of being healthy by containing romaine lettuce or some other salad greens - a fact that explains why so many dieters order it - it's actually pretty fattening due to the bacon, egg or mayo, cheese, and croutons - which is why it's so delicious! 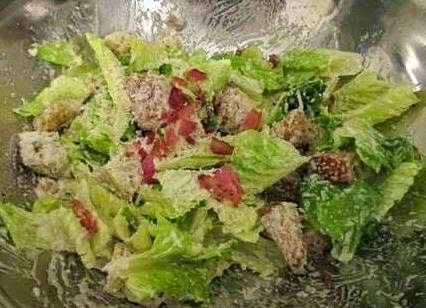 Caesar salad makes a great appetizer and side dish, and in a larger portion, also makes a great main meal either as is or topped with a little lean grilled or pan cooked chicken breast, steak, or fish. Taking for granted that your Classic Caesar is so unhealthy, I decided to tweak it a little to cut back on the cholesterol. For those of you that dig the fattiness of the original, I've listed a more traditional recipe first. Serves 2 as a starter or side dish or 1 very hungry person as a meal. 1 Large clove (the pieces that come off a bulb) of Garlic - peeled and grated - this will you give you smooth, even garlic paste without a garlic press - just be sure to watch your fingers! 1 or 2 slices of Bacon, finely chopped or cut with a clean sturdy pair of kitchen scissors - cooked in a pan with a little water. The water will allow the bacon pieces to cook evenly. Once the water evaporates, continue cooking until the bacon is reddish brown around the edges and crispy. Drain on paper towels and cool - OR - if you're Pescatarian (a vegetarian that eats fish) or a Vegetarian in denial about the anchovies - 1 or 2 Tablespoons of Fake Bacon Bits - you can find these in any grocery store - usually with the bulk spices - they are typically made of soy, but there are varieties made with flaked coconut as well. Read the label carefully. 2 or 3 Cups of Chopped or torn into pieces Romaine Lettuce - Romaine lettuce is one of the more popular varieties of lettuce and can be found in grocery stores and fruit stores everywhere. You can even buy it already washed - but that tends to be expensive. Better to just buy an unwashed head of romaine, separate the leaves, give 'em a good rinse and then either dry them with paper towels or in a salad spinner or give 'em a good shake. 1 Cup of Croutons - Though you can buy these, I hate store bought croutons. I find them dry, too salty, over flavored, and cut WAY too small... so I learned to make my own! 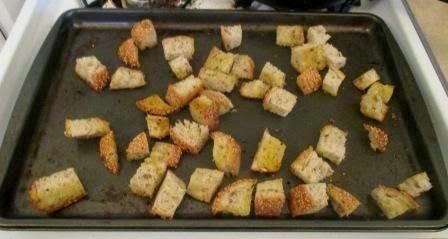 All you need to do is cut your favorite bread into rectangles or cubes - I use whole wheat or multigrain - toss them in a little Olive oil, season with a dry herb of choice or a mixture (I used Mediterranean seasoning) and/or a little garlic powder, and if you wish, salt and pepper, and toss them in 350 F oven for 10 minutes, turning them after the first 5 minutes. Let 'em cool and presto! You've got croutons! See the image below. Crack your egg into the salad bowl and scoop out any shells (it happens), OR if using mayonnaise, dump it in. Add three tablespoons of parmesan cheese, the anchovies or Worcestershire sauce, and lemon juice and beat the heck out of it using either a whisk or fork until everything's well combined. Add the Olive Oil a tablespoon at a time and whisk it well after every addition. Give it a taste, remembering that the dressing is supposed to taste strong, and season with Salt and Pepper. 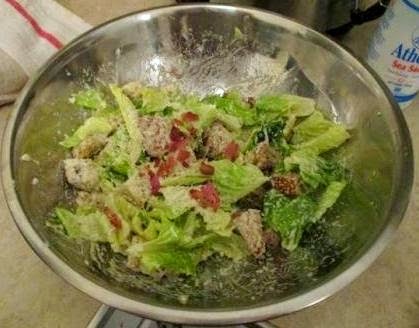 Dump in your lettuce, croutons, and half your bacon bits, and toss everything to coat. Top with the remaining parmesan cheese and bacon bits and you're ready to go! Serves 2 as a side dish or 1 as a meal. 2 Heaping Tablespoons of 2% Fat Plain Greek or Regular Yogurt - this will be the primary substitute for the egg or mayonnaise from the previous recipe. I chose it because it provides creaminess but with way less cholesterol than a large egg. Dump the yogurt and mayo in the large bowl along with the lemon juice, anchovies, some parmesan cheese, and salt and pepper and whisk to combine. Add the Olive oil, a tablespoon at a time, whisking after each addition. If the dressing seems to thick for your taste, add a little more lemon juice and Olive Oil. Dump in the lettuce and the croutons toss to coat. Top with the bacon bits and remaining parmesan cheese and you're good to go! Stay tuned for next time when I'll be showing you how to make that American classic: Cobb Salad!